I unwrapped a lovely tea toy today! 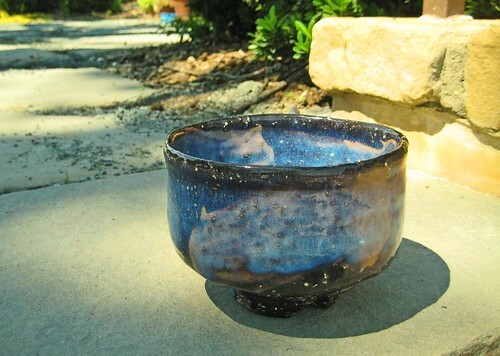 This blue hagi-yaki chawan (tea bowl) was made by Yamane Seigan, who first created the blue hagi glaze and style. If it seems familiar, that's because Alex of Another Tea Blog also owns a Seigan piece. For some more info on this wonderfully talented potter, see here and here (thanks for the links, Alex). If you're interested in Yamane Seigan's work, check out MagokoroDo on eBay; they have tons of his stuff on auction, and you can get a good deal if you're patient. Zencha.net also has some of his work, as well as other quality blue hagi-yaki. If all else fails, send an email to Toru from Artistic Nippon; from what I've heard, he is happy to seek out items for customers. I can't wait to take it for a spin (whisk?)! How does texture of the bowl feel? How does it make you feel? It is such a lovely piece, I could stare at the picture all day long. I'm so glad Alex introduced us to this potter and style. Now I just need to get my hands on one! I'll write here what I wrote over on TeaChat: "It's actually lighter than I would have imagined, but it does have some heft. It has an ergonomic feel that my other wares don't, and it feels oddly like unfired clay." I'm no expert on this kind of pottery, but after handling this chawan I think I understand why some people love the more rustic styles. Yes, you should! It's really worth it, IMO. Thanks to you both for the comments! "I'm no expert on this kind of pottery, but after handling this chawan I think I understand why some people love the more rustic styles." First of all, nice blog! Very diversified. I initially didn't care much for Hagi because I thought most of it looked sloppy and ugly. On much of it, I still think so. However, the blue "aohagi" manages to be pleasing to the eye and a pleasure to use, while retaining that old, rustic feeling you just don't get with most Arita or Kyoto-ware. It is an excellent introduction to the concept of beauty in the imperfections, and can begin the process of getting us to accept and understand the concept of wabi-sabi. I think there are two reasons why rustic is often preferred, and it is important to judge this kind of item only after actually using it. I think the "earthy" feel from using rustic teaware goes very well with tea, which is one of nature's wonders. I also think that "perfect" items that are also symetrical can get quite boring after continued use. The colors are very beautiful. Ranging from earth to water. And sky. I bought one of his. Waiting for delivery. I bought it as a gift. The rustic quality is of course very preferable, for it is the earth calling through the vessel. I'm not sure I took enough time on this purchase. But I'll see when it's received in some weeks. I'm looking for one for myself, or two. If you find any with this rustic, yet perhaps more rounded appearance with that shape differentiation all around with a fuller lip, I'd like to see that one! !